The big news this week in the Apple portable orbit was some significant price cuts on new machines, which will of course filter down in the form of corresponding price drops on used units. In the US, only the 12" LittleAl 'Book and 15" TiBook prices were reduced, but Canadians, who have complained that Apple's computer pricing has been slow to adjust to the roughly 12 percent rise in the value of the Loonie versus the US dollar since the first of the year, got a more comprehensive round of price cuts, including the 17" PowerBook and the iBook line as well as the 12" and 15" PowerBooks. In the Great White North, the Apple Canada Store now offers the BigAl PowerBook 17" for $4,699, down from $5,299, but still higher than in the US at the current exchange of $1.00 US = $1.37 Canadian (1 CAD = 0.73 USD), even though the U.S. price on this model (US$3,299) has not been cut. "Meanwhile, Apple Computer ranked ninth, with 298,000 units shipped. Apple was behind eighth-ranked Acer's 428,000 units, but Apple shipped more than twice as many units as tenth-placed Gateway, which mustered only 111,000 units during the quarter." Apple has posted a new Knowledge Base article explaining how to distinguish the various PowerBook G4 computers from one another. Peripheral Enhancements Corporation has announced that it has partnered with PC Connection, Inc. to launch the new EDGE DiskGO! USB Watch Flash Drive. This latest offering from Peripheral's DiskGO! line of USB products will be sold exclusively through PC Connection over the next thirty days. The DiskGO! Watch is available in 128 MB and 256 MB capacities and serves as a fully functional watch with an integrated USB 1.1 Flash Drive. The DiskGO! Watch plugs directly into virtually any computer's USB port and is plug-and-play compatible with all popular operating systems. The DiskGO! Watch immediately appears as a hard drive on the user's desktop, allowing easy transfer and storage of pictures, MP3s, slide presentations, spreadsheets and other data. The Watch's USB 1.1 drive writes at 1 MB per second and reads at 4.2 MB per second. Secure Password Protection software is built-in for added security. "Gone are the days of users carrying a heavy laptop, low-capacity floppy disks, or other cumbersome media from the office to home, or from the office across the country simply to transport important files. The DiskGO! Watch provides the ability to take a PowerPoint file, for instance, to a meeting across the country, while serving as an attractive wristwatch," said Brian Sartorius, Vice President of Operations for Peripheral Enhancements. Kandi Stinson, VP Sales for the company, commented "We're excited to be the first in the U.S. to offer this unique product to the market and are pleased that PC Connection has partnered with us for the launch. Our success with our existing DiskGO! USB Flash drives prompted us to explore other form factor options and a wristwatch was a unique and natural choice." EDGE Memory DiskGO! USB Watch Flash Drives are exclusively available for purchase at pcconnection.com and will be broadly released to other Peripheral partners in early July. The Hitachi Travelstar 80GN is a 9.5 mm high, 4200 rpm, 2.5" mobile hard disk drive. The Travelstar 80GN brings a 26th generation addition to the long line of Travelstar family drives. The innovative hard drive design combines AFC Media, Fluid Dynamic Bearing (FDB) motor technology, Giant Magnetoresistive (GMR) heads, Partial Response Maximum Likelihood (PRML) digital channel, head load/unload technology, Enhanced Adaptive Batter Life Extender™ (ABLE) 3.0, and an ATA/100 interface. With this design, the Travelstar 80GN provides exceptional quietness, storage capacity, performance, power management and quality required by today's demanding notebook systems. The new Travelstar 80GN breaks current areal density records by allowing up to 70 Gb per square inch to be written on each disk. This was achieved by adding another coating of "Pixie Dust" - or an additional ruthenium/magnetic layer to create a five-layer sandwich called laminated - "Pixie Dust". These additional layers bring even higher thermal stability to the media, allowing data recording at ultrahigh densities while maintaining data-integrity. As a result, the Hitachi Travelstar drives are suitable for demanding, high capacity Internet, digital audio, video streaming, and real-time multimedia applications - whether users are in the office or on the road. The Hitachi Travelstar 80GN hard drive uses proven storage technologies such as TrueTrack Servo, Drive Fitness Test™ (DFT), Self-Monitoring Analysis, and Reporting Technology (S.M.A.R.T. ), as well as an adaptive control device that helps maintain high performance and fast seek times at high environmental temperatures. The Travelstar 40GNX redefined state-of-the-art storage for mobile computing. The reduced acoustics, high speeds, and capacities of Hitachi Travelstar drives support superior digital content creation capabilities, higher quality digital audio and video, and significantly faster processing for data-intensive multimedia and Internet applications. Capacities from 20 to 80 GB, 4200 rpm, ATA-6 hard disk drive 80GN offers high capacity and high performance in the industry with an 80 GB, 9.5 mm hard drive. Travelstar leverages latest laminated Antiferromagnetically-coupled (AFC) media, also known as "pixie dust"
30 GB IBM Travelstar 4200 rpm 9.5 mm UltraSlim. 1 yr IBM Warranty. Fits in all G3 (Wallstreet, Lombard, and Pismo) and G4 PowerBooks, will also fit in all iBooks (white 2001 iBook2 and colored iBooks). 40 GB IBM Travelstar 40GN 4200 rpm 2048K Buffer 9.5 mm UltraSlim. 1 yr IBM Warranty. Fits in all G3 (Wallstreet, Lombard, and Pismo) and G4 PowerBooks, will also fit in all iBooks (white 2001 iBook2 and colored iBooks). 40 GB IBM Travelstar 40GNX 5400 rpm 8192 KB Buffer 9.5 mm Slim. Model IC25N040-AT-CS-05-0, IBM part number 07N9482. Fits in all iBooks, G3 (Wallstreet, Lombard, and Pismo) and G4 PowerBooks. 60 GB IBM Travelstar 80GN "Moraga" Series Drive, 2.5" platter, 4200 RPM, 9.5 mm high, 12 ms avg. seek time, ATA-6 drive. Model Number: IC25N060ATMR04. Fits in all iBooks, G3 (Wallstreet, Lombard, and Pismo) and G4 PowerBooks. 80 GB IBM Travelstar 80GN "Moraga" Series Drive, 2.5" platter, 4200 RPM, 9.5 mm high, 12 ms avg. seek time, ATA-6 drive. Model Number: IC25N080ATMR04. Fits in all iBooks, G3 (Wallstreet, Lombard, and Pismo) and G4 PowerBooks. "Hitachi has unveiled what it claims is the first 7200 rpm hard drive designed for mobile systems, the Travelstar 7K60. "The 7K60 spins 33 per cent faster than a 5400 rpm drive, which contributes to a 15 per cent improvement in data transfer rates and a 20 per cent lower rotational latency, i.e. the time it takes to get the data required in position under the read-write head." You want to check if your laptop Mac or your screens or LCD displays have any dead pixels? You want to buy a secondhand laptop Mac or LCD display but you want to check it first? You have multiple screens connected on the same Mac and want to check all of them without changing the connections? Then Pixel Tester is what you need. You can test all possible and existing colors on your screen simply by moving the mouse, which is funny, simple and fast. You can in particular test pure red, pure green and pure blue by moving the mouse at the bottom of the screen, and pure white by moving it at the top of the screen. You can test pure black at the end of the test. It uses several patterns to help you to detect dead pixels more easily. It supports multiple monitors and asks you at launch which one you want to test. It takes very little memory, CPU and disk space. It doesn't need any installation which makes it very easy to use. It is available in English and in French. It is compatible with Extended Software Updater. Minor bugs have been corrected. French localization has been released. 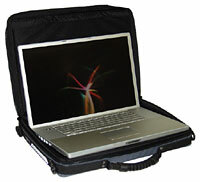 The Mission Light 17" PowerBook case is a lightweight, economical solution for safely transporting your PowerBook. The simple effective design offers excellent protection for you PowerBook in a clean, lightweight case. Excellent protection for your 17" PowerBook afforded by 1.2 cm (0.5") foam reinforced by corrugated plastic on the back, high density polyethylene reinforcement on the handle side and 4 mm (1/8") hardboard on the bottom. 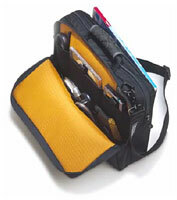 Great comfort insured by a heavy duty mountain bike grip and a wide, contoured, thickly padded shoulder strap. Briefcase handle double rivet reinforced through the wrap handle to insure the safety of your laptop. Outside flat, outer pocket for airline tickets, thin paperwork, etc. 12" RacerX dimensions: 12" x 10" x 4.5"
15" RacerX dimensions: 14.5" x 11" x 4"
17" RacerX dimensions: 16.5" x 11.6" x 4.5"
Exterior pocket for magazines and papers. Prices start at $129 from SFBags.com..